Remixed item: Blue Peter Pan Collar Modcloth Dress. So the other day I was brainstorming some new post ideas I could use for the blog, and a 'remix' feature came instantly to my mind... I think it's so important to gain inspiration from others, but more importantly to gain inspiration from yourself. At times, no other person can be more inspiring to you than your own self once your personal style is developed. I've always found it fun and interesting to look back into the old archives of my blog and see what I was wearing or what I was inspired by at the time...So why not make a series out of it?! For this new series I just plan on taking one item and posting the different ways and dates that I wore it. Fairly simple, right? I don't particularly have a set schedule of days or the frequency of how I'm going to do this new feature, but perhaps I'll just figure it out as I go along. 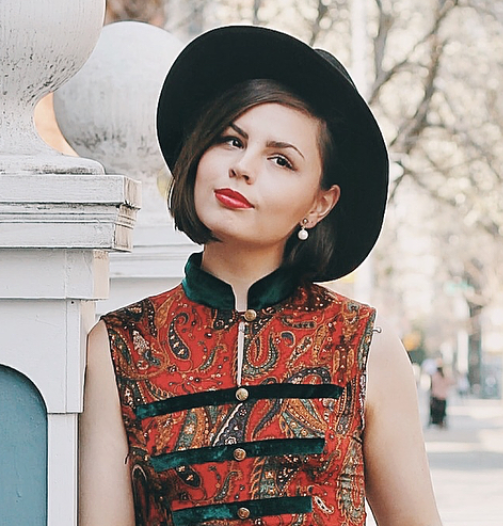 I always love seeing how other bloggers remix their outfits. Also nice to know that not everyone is running out and buying new clothing all the time...hehe. Anyhow, each look is really gorgeous..but my favorite is the first. I am such a hat and tights sucker both. I really think both pieces make the whole outfit pop. The dress is quite perfect on it's own though. What a great idea! I can't wait to see more. I love how creative the last one is,but my absolute favorite is the first. I love it with the red and with the skirt! i MIGHT just steal this feature from you. :) it's a great concept and i'm trying to figure out how to add some new interesting stuff to my blog. i really love the first and third outfits! My favourites are the first one and the third one. It is a really beautiful dress! Great idea! I love the first option best, you look so beautiful! I'd say I like the first and last ones best, particularly the 1st one! I wish I could carry off white tights! The only time it has worked is when I dressed up as Elizabeth Bennett from Pride and Prejudice for world book day last year! 1st off, i like every single way you wore the dress. you asked for my fave though, & it's the bottom photo with the patterned skirt. sigh.